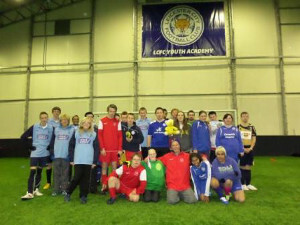 Leicester City Ladies were looking to continue their performance from last week’s game. What a game this was it was a complete goal fest. Leicester City Ladies had a shocking start to the game with conceding 2 goals within the first few minutes, which soon woke Leicester up to realise Harborough Town were not a team to be taken lightly. Leicester City Ladies soon stepped it up a gear with some outstanding passing from there mid-fielders Paige, Madeleine and sticker Madison. With Harborough Town starting well defensively and with 10 minutes gone Leicester City Ladies were patent and they were rewarded with their first goal courtsey of Madison score now 1-2. Leicester City Ladies were now on the hurt for the equalizer and it came within 2 minutes of the restart and it was a very well worked second goal for Leicester’s Madison which involved some good fast football from Leicester’s midfielders Paige, Sophie and Madeleine. Harborough Town were still pressing with good affect having several chances on goal which tested both Leicester City Ladies defenders Katie and Alanya as well as goal keeper Tillie. Fifteen minutes through the first half Leicester City Ladies conceded a corner, which Harborough took full advance of driving the ball low and hard into the near post which sent some confusion through the Leicester defence and a goal mouth scramble ended in the ball being carried over the line despite the best efforts of keeper Tillie, score now 2-3. Leicester City Ladies now went on the offensive throwing everything at Harborough in the last 5 minutes by scoring 3 goals in quick concession all courtesy of Madisont who at half time had 5 goals and would be looking for another to secure a double hat-trick. The second half started just as lively as the first finished with Leicester City Ladies attacking the Harborough Town defence at every given chance and it wasn’t long before Madison scored for Leicester thus securing her second hat-trick of the game. Harborough Town never sat back they also continued to pass the ball around well and tested Leicester’s defence. Minutes after the restart Harborough caught Leicester on the counter attack and took opportunity with both hands by scoring an easy goal score now 6-4. Both teams were battling hard for it in midfield, 15 minute into the second half Leicester’s midfield work really well together to create some good link up play between them which released Paige to score her first goal of the game score now 7-4. On the restart Harborough ran at Leicester’s defence but they stayed strong but then lost the just out the box and again Harborough pressed and come away with a very well worked goal, score now 7-5. Now in the last 5 minutes of the game and both team were still looking for goals, Leicester keeper pulled off some outstanding saves to deny Harborough. A good clearance from Tillie released sticker and sister Madison who took on Harborough defenders to score her seventh goal of the game. A very enjoyable game with lots of action and plenty of goals, unlucky for Harborough as they played right up to the end never giving up. Leicester’s over all game was outstanding with some good passing for the whole team. A second good win for Leicester City ladies and another 3 points moving them slowly up the league table. Leicester City Ladies surrendered their long standing league home record versus a dangerous Rotherham side. The game was played in a good tempo, Leicester looking to play high up the pitch and Rotherham looking to counter attack. This paved the way for a good competitive football match. By half time neither team managed to break the dead lock. Early in the second half Keicester City Ladies cross turned shot somehow didn’t go over the line. Rotherhams counter attack with a very talented front line possed problems all day long for City and on the hour mark the visitors got their reward and took the lead. Leicester City Ladies threw bodies forward in search of a point but late in stoppage time were countered once again and the visitors took all three points. This was a vital game at the top of the Midland Combination with Leafield were the visitors to Linwood Park, having beaten Leicester City Ladies 3-2 at their ground in September. The first half was a low tempo, scrappy affair, both teams had chances but the scores were level at the interval. Second half the Leicester City Ladies were better and played further up the pitch. The visitors were always dangerous on the break. Both teams had chances to score but it did not come until deep in stoppage time when Brants second corner delivery on the bounce was delivered high to the back post for Burbidge to power home a superb header high into the net to win the game for Leicester City Ladies. Overall a difficult game all round for both sides, City maybe edged the second half although Leafield had chances. This was a solid display and although maybe lacking Leicesters usual tempo it was a vital win in a very open Combination division with the Ladies now sitting in second place. The Cups have thrown up some classic matches at Aylestone Park for Leicester City Ladies under Matt Cook and this one was no different. Memories of Cardiff City in a FA Cup 3rd round and penalty shoot outs against Leicester Women and Wolves in the past to name a few. This time it was Leicester v Leicester for the third time this season and it went all the way. It was a close encounter throughout , Amanda Whalley opened the scoring for the home side finishing from close range. Before half time the visitors were level as the women striker pounced on a loose ball to finish one on one with the goalkeeper. Second half was very similar to the first, a tight encounter but it was the home team the brighter and Kilby restored Ladies lead with a finely executed free kick. There was some close chances at both ends before Leicester Women pulled the scores level again, a similar chance and the same result to take the game to extra time. Both sides hit the cross bar in those 30 minutes but not enough to stop the game going to the dreaded penalty kicks. Leicester City Ladies have been unlucky numerous times in shoot outs and maybe even fear them a touch. Their lucked turned however two saves from keeper Cat and the cross bar sending Leicester City Ladies through the first round. Overall a good cup tie and good spectacle for all and Leicester City Ladies are delighted to be on the end of a winning penalty shoot out at last, turning round last years County Cup quarter final which saw the Leicester Women through on penalties at Aylestone Park.